Is there anything like "Kars"
"Kars" is a hepatoprotective drug, it includes the extract of the fruit Silybum spotted. The active ingredient is an analogue of silymarin. "Kars" is used for toxic liver damage after hepatitis, chronic hepatitis non-viral origin, chronic intoxication, alcoholic and nonalcoholic hepatic steatosis, long-term drug therapy in the complex treatment of liver cirrhosis (only as an additional means). "Karsil" stimulates General metabolism, synthesis of proteins and phospholipids and accelerates the regenerative processes in the affected liver cells. The drug has an antioxidant effect, improves microcirculation. After his admission indicators state of the liver and digestive tract improves, the patient returned appetite. Adults and children over twelve years for the treatment of serious liver damage "Karsil" you need to take four tablets three times a day. Drug drink before meals. A daily dose of 420 mg. For maintenance treatment, take one or two tablets three times a day. As a preventive means to take two or three pills per day. The duration of intake of the drug – not less than three months. During the reception, "Kars" can appear the following side effects: nausea, diarrhea, dyspepsia, rash, alopecia, pruritus, exacerbation of existing vestibular disorders. They all disappear after discontinuation of the drug. 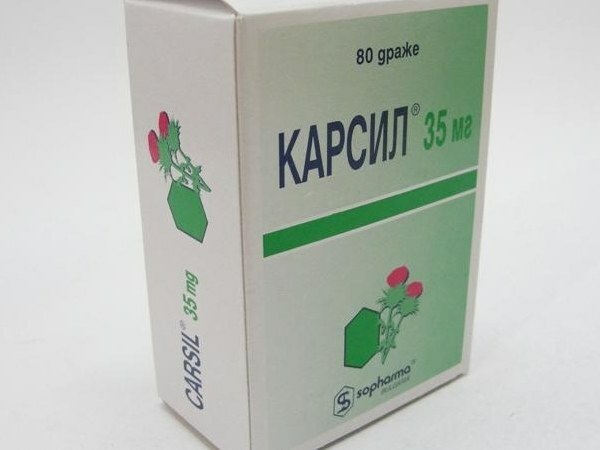 "Karsil" contraindicated in children under the age of twelve years, in case of hypersensitivity to the components. During pregnancy, breast-feeding, the drug is prescribed only under strict indications. When using "Kars" may be a manifestation of an estrogen-like effect of the active substance and the drug is prescribed with caution to patients with diseases caused by hormonal disorders (endometriosis, uterine cancer, carcinoma of the breast, uterus, ovaries, prostate). While the use of "Kars" oral contraceptives and medicines used in hormone replacement therapy, may reduce the therapeutic effect of the latter. "Karsil" can potentiate the effects of "Diazepam", "Ketoconazole", "Alprazolama", "Lovastatin", "Vinblastine". The drug contains wheat starch, it should be considered in patients with celiac disease (coeliac). "Kars" is available without a prescription. The drug should be stored in dark dry place at a temperature up to 25C. Shelf life – two years.